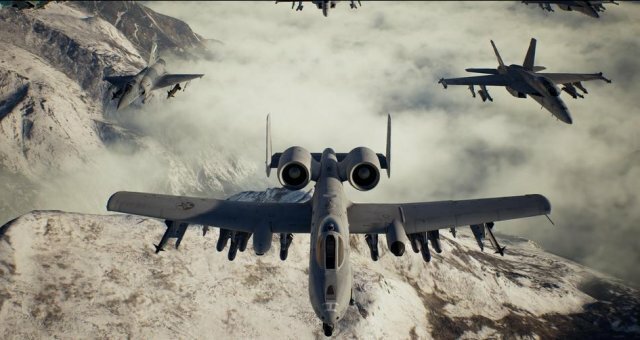 This is an achievement guide for Ace Combat 7: Skies Unknown! This guide covers all achievements, but combines them in an easy-to-read format since many of them function similarly or will come naturally in your gameplay. First things first, just play the game! You'll get introduced to tutorial segments in the beginning missions that will explain the game's mechanics and controls. There are 20 missions in the game, completing each one will earn you an achievement. There's also a 21st achievement for completing the full game, so you really get two achievements for the final mission. Please make sure you read the section "There And Back Again" so you get this out of the way early on! This covers 21 of the 22 hidden achievements (and hopefully There And Back Again). We'll talk about the 22nd hidden achievement below, in the ACE OF ACES section. This is the second-hardest achievement in the game. You must earn an S Rank on every campaign mission on Ace difficulty. You CAN do this in Free Mission! The Hardened Vet achievement requires that you complete the campaign on all four difficulties: Easy, Normal, Hard, and Ace (which requires completing Hard to unlock). This does NOT work in Free Mission. You have to actually "Restart Story" and play the difficulties you haven't played yet in order to earn Hardened Vet. So, for example, if your first campaign run was on Normal difficulty, then you still need to do campaign runs on Easy, Hard, and Ace. Throughout the course of your gameplay, you can earn medals for your performance. There are 25 single-player and 10 multiplayer medals available to earn. You only need to earn a total of 25 medals to earn these three achievements, including The Highest Achiever. However, in order to actually trigger the achievement, you need to earn a campaign medal to hit the target numbers (5, 10, 25) or above. So, for example, you can earn 7 multiplayer medals, but you won't get the first achievement until you earn one campaign medal (total of 8, greater than 5). But if you earn 16 campaign medals, and then earn 8 multiplayer medals, and then earn one more campaign medal for 25 total, that will also trigger the achievement. Get it? Good, now get to earning those medals! At the start and end of some missions, you'll be asked to takeoff, perform a mid-air refuel, or land. Some missions, such as Mission 3, will change whether you takeoff or refuel depending on whether you use a carrier-capable aircraft or not. This achievement is really easy to earn. All you have to do is just complete all takeoff, refuel, and landing sequences in your first campaign run. Do not skip these sequences, or you'll invalidate the achievement! You must actually do all of them. No specific speed is required, just complete them at all. Ace Combat franchise veterans will recognize the "named aircraft", also known as "aces". These are special units that only appear under certain circumstances. Maybe you have to shoot down the enemy bombers using the 4AAM special weapon, or maybe you have to destroy that one control tower. Whatever the case may be, these named aircraft are hiding all over the game's campaign. You cannot spawn the named aircraft in a mission until you complete that mission once. So, obviously, you can't spawn all of the named aircraft until you complete almost the entire campaign (there aren't any in the final mission). Once you complete a mission, you can go back to it in either a new campaign run or in Free Mission to hunt down the named aircraft. You also can't spawn these guys on Easy difficulty. It has to be Normal, Hard, or Ace. In the main menu, you'll find the Data Viewer, and in the Campaign Assault Records, you'll find a named aircraft checklist. Any slots that are filled in are the named aircraft you've already shot down. Any slots that show no information at all are for missions you haven't finished yet. Otherwise, the slots will give you some hints as to where and how to find these named aircraft. If you don't want to go through the trial and error, there is a guide. This is going to be the most annoying achievement for everyone. Frequent Flyer asks that you fly a cumulative total of 76,500 km (~47,535 miles) across the campaign mode. Keep playing the game normally. Unlock everything you want to unlock, including emblems, nicknames, and skins. The amount of time you spend in missions will add up. Use Campaign -> Free Mission -> Free Flight and just fly in circles for 30 minutes (rubberbanding, woo!) to add up a bunch of distance. Rinse and repeat every 30 minutes. Aircraft Annihilator wants you to destroy 3,000 enemy units over the course of your campaign run. Don't even worry about this, you'll earn it while gunning for the other achievements. Yeeeeep. Just like Ace Combat 6, Assault Horizon, and Infinity, Ace Combat 7 comes with multiplayer achievements as well. You'll need to play at least 50 Team Death Match matches, and at least 50 Battle Royal (Free For All) matches. You'll have to win at least one of each, and you'll have to play on all six available maps. This will cover all of the multiplayer achievements. There's a few achievements related to earning MRP (the game's version of Credits from older Ace Combat games) and purchasing items on the Aircraft Tree. These achievements will come naturally with your gameplay while going for the other achievements, so don't worry about them. Just keep in mind that you will have to complete all branches of the Aircraft Tree, both single-player and multiplayer. But you'll see, you earn MRP a lot faster than you may initially think.